In my previous post, I explained how the Participation staff team was going to work with a clear focus, and today I want to explain how we are going to amplify this support to all local communities thanks to a project inside the Reps program called Regional Coaches. 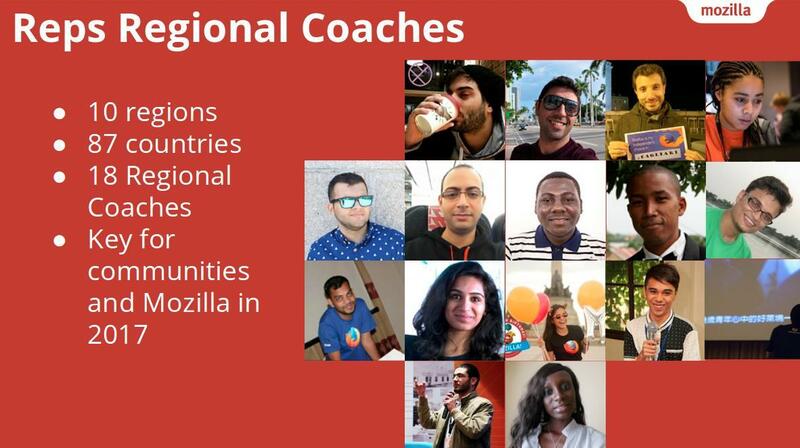 Reps Regional coaches project aims to bring support to all Mozilla local communities around the world thanks to a group of excellent core contributors who will be talking with these communities and coordinating with the Reps program and the Participation team. We divided the world into 10 regions, and selected 2 regional coaches to take care of the countries in these regions. Region 3: Ireland, UK, France, Belgium, Netherlands, Germany, Poland, Sweden, Lithuania, Portugal, Spain, Italy, Switzerland, Austria, Slovenia, Czech Republic. Region 10: Thailand, Cambodia, Malaysia, Singapore, Philippines, Indonesia, Vietnam, Australia, New Zealand. Develop a clear view of local communities status, problems, needs. Help local communities surface any issues or concerns. Provide guidance/coaching on Mozilla’s goals to local communities. Run regular check-ins with communities and volunteers in the region. Coordinate with the rest of regional coaches on a common protocol, best practices. Be a bridge between communities in the same region. We want communities to be better integrated with the rest of the org, not just to be aligned with the current organizational needs but also to allow them to be more involved in shaping the strategy and vision for Mozilla and work together with staff as a team, as One Mozilla. I would like to ask all mozillians to support our Regional Coaches, helping them to meet communities and work with them. This project is key for bringing support to everyone, amplifying the strategy, vision and work that we have been doing from the Reps program and the Participation team. We have on-boarded 18 regional coaches to bring support to 87 countries (wow!) around the world. Currently they have started to contact local communities and hold video meetings with all of them. Mozilla communities are very diverse, and their structure and activity status is very different. Also, there is a need for alignment with the current projects and focus activities around Mozilla and work to encourage mozillians to get involved in shaping the future. In region 1, there are no big formal communities and mozillians are working as individuals or city-level groups. The challenge here is to get everyone together. In region 2 there are a lot of communities, some of them currently re-inventing themselves to align better with focus initiatives. There is a huge potential here. Region 3 is where the oldest communities started, and there is big difference between the old and the emerging ones. The challenge is to get the old ones to the same level of diverse activity and alignment as the new ones. In region 4 the challenge is to re-activate or start communities in small countries. Region 5 has been active for a long time, focused mainly in localization. How to align with new emerging focus areas is the main challenge here. Region 6 and 7 are also very diverse, huge potential, a lot of energy. Getting mozillians supercharged again after Firefox OS era is the big challenge. Region 8 has some big and active communities (like Bangladesh and Taiwan) and a lot of individuals working as small groups in other countries. The challenge is to bring alignment and get the groups together. In region 9 the challenge is to bring the huge activity and re-organization Indian communities are doing to nearby countries. Specially the ones who are not fully aligned with the new environment Mozilla is in today. Region 10 has a couple of big active communities. The challenge is how to expand this to other countries where Mozilla has never had community presence or communities are no longer active. I believe the Reps program can make a difference to improve our community. I’m excited to help in some way. It is great to read more about the plans and the evolution of the Regional Coaches. I am not sure I can speak for the UK community, but I think that this will really help us. It was interesting to see the categories that different countries have been grouped into. I do not disagree with the assessment of the UK, but it is worth noting that we do demonstrate characteristics of a category one nation - no formal community and Mozillians working as individuals. But I do think a “region 3” is possibly a better summary of where we are at. So what are the next steps? Will regional coaches contact us…or should we contact them? I continue to think that Regional Coaches are a great idea and could really help us in the UK. Look forwards to hearing more. @edovio has already done some initial reach out to the UK community AFAIK. @Seburo I’m here for any information and please contact Tom Farrow ASAP in order to make a first video call to talk about the UK community! Thanks Geraldo! Appreciate the quick feedback on your community. I’ll try to reach out to you and other members of the Brazilian community ASAP. Hopefully, through this new experimental program we’ll be able to grow as a Region, empower communities and help in any issues we might (and will) find on our way. We are going to have a call with all community to talk about this things soon. Just wait because we are doing some work on the conflict resolution council before we have this meeting. I believe this is very important to do before the community meeting to make it in a proper way. Thanks for your inputs but bare with us please.